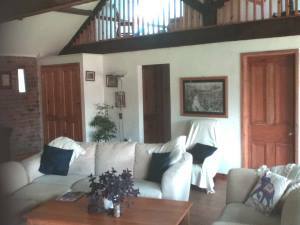 A converted former barn with additional middle barn and a byre. The middle byre could be used for parking or could be converted as an extension to the existing barn conversion and the byre has plans drawn for further two bed accommodation. The property is located in the historic village Of Burgh By Sands, five miles to the west of the city of Carlisle. It is close to the Solway Heritage Coast and on Hadrian's Wall, within easy reach of the Lake District and Scottish Borders. 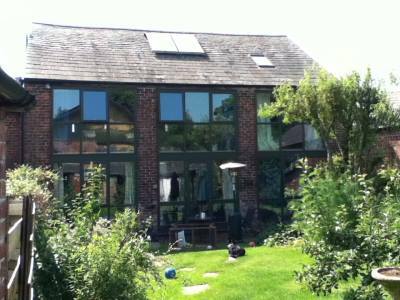 The barn conversion benefits from having sealed unit double glazing throughout, underfloor heating and solar panels. The solar heating assists the domestic hot water and provides for the underfloor heating system. Mains gas, water and sewerage. Dining kitchen (23'1 x 11'1 overall) Exposed brickwork to one wall. Fitted pine units with timber worksurfaces and tops. as range cooker with ovens and hob. Belfast sink with mixer tap. Exposed ceiling timbers, glazed door to the staircase and stone flagged floor. Stairs leading from the dining kitchen to the first floor. Dining room (11' x 13'10) with stone flagged floor. Sealed unit double glazing with french door, exposed beams and ceiling timbers. Inner hallway with stone flagged floor, exposed beams and stripped pine doors off. Shower room with a fitted white three piece suite comprising low suite WC, pedestal wash hand basin and double shower cubicle with sliding door. Air vent / extractor. Bedroom (10'6 x 13'10 overall) with exposed beam. Bedroom (10'1 x 7'10 overall) feature arrow slit window with sealed unit double glazing. Utility room with a gas boiler for the domestic hot water and central heating. Controls for the solar heating. Walk-in pantry with stone sconce and exposed beams. 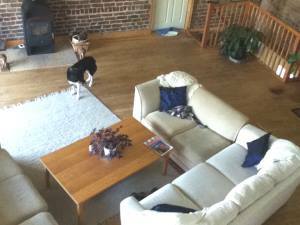 Living room (27'3 x 22'6 overall) with hardwood chestnut flooring, exposed king truss beams, arrow slit windows to the rear and exposed brickwork to two walls. Windows look out to the garden. Stairs leading from the living room off to the galleried rooms which overlook the living room. Galleried room one (10'8 x 7'5 overall) with sloping ceiling, Velux window and eaves storage. Galleried room two (10'8 x 7'8 overall) with sloping ceiling, Velux window and eaves storage. Bedroom / study (12'8 x 10'9 overall) with hardwood chestnut flooring, recessed lighting and an en-suite shower room with a fitted three piece suite comprising low suite WC, vanity wash hand basin and double shower cubicle with sliding door. Bathroom (10'3 x 6'11) with double end bath, sink and toilet and arrow slit windows. Secret garden with enclosed courtyard with lawn and landscaped area. Storage sheds being brick built with slate roofs (ideal for a project). Garden pond with plants and frogs. Vegetable garden, fruit trees and bushes. 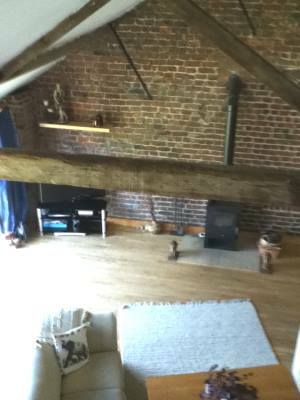 Measuring 39'3 x 26'5 this barn has exposed king trusses and beams and provides access from the road to the courtyard. 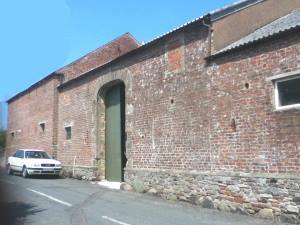 Currently used for parking, large scale projects and access to the byre. Measuring 29'9 x 21'1 various proposed plans have been drawn but not submitted. These are all for a two bed unit with various living room, study, bathroom, WC, kitchen and utility room arrangements. © Barnsetc 2013. All rights reserved.